Spot the really chunky grey window frames which look very out of place. The building to the left has much slimmer, sleeker black frames. 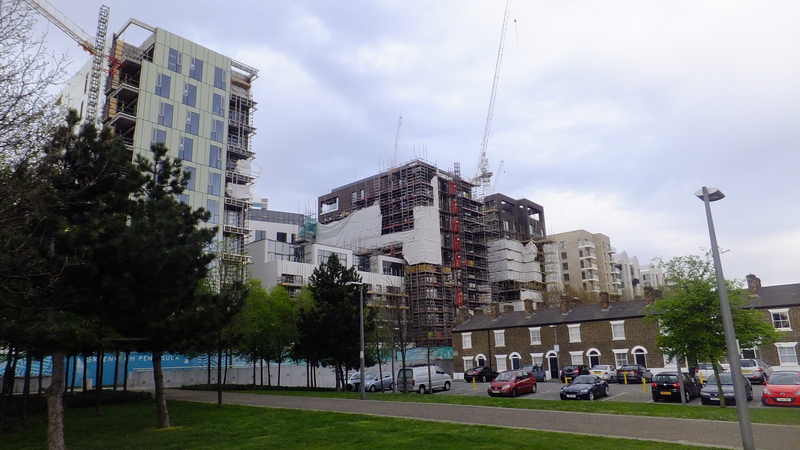 Also in the south-east of the Peninsula is the newest phase of the Greenwich Millenium Village, which is now almost complete. As is the norm for the Peninsula and much of the country, building has occurred at a snails pace over the past 15 years despite the huge demand for housing. Aside from that, and I really quite like the look of this: The scale of the buildings here are what is needed in many parts of London to provide badly needed housing. It’s the type of scale that is commonly seen in many European city centres, lining many major streets. The centre of London has a low population density compared to most other major cities, combined with very high rent and housing costs, and this has increasingly forced many out to the outer reaches placing further strain on the transport network. This sort of density should be the norm from zones 2-3 in, and even in a fair few areas outside close to stations. 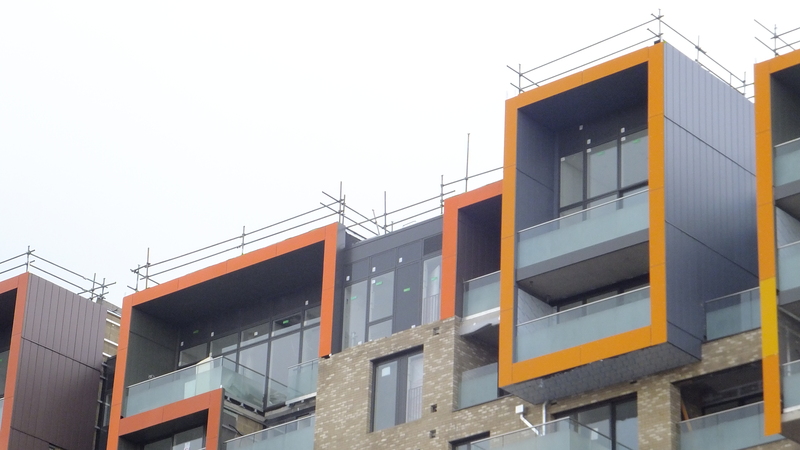 Also close to completion in the area beside Knight Dragon’s developments is Bellway’s ‘Platinum Riverside’. 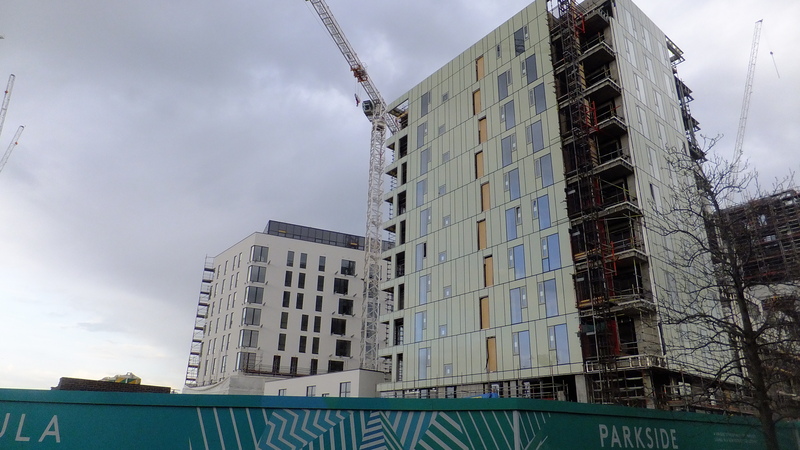 This second riverside tower (though it’s more like a slab) is located beside Bellway’s first Greenwich Peninsula development from a couple of years ago. The bits revealed so far look decent enough. 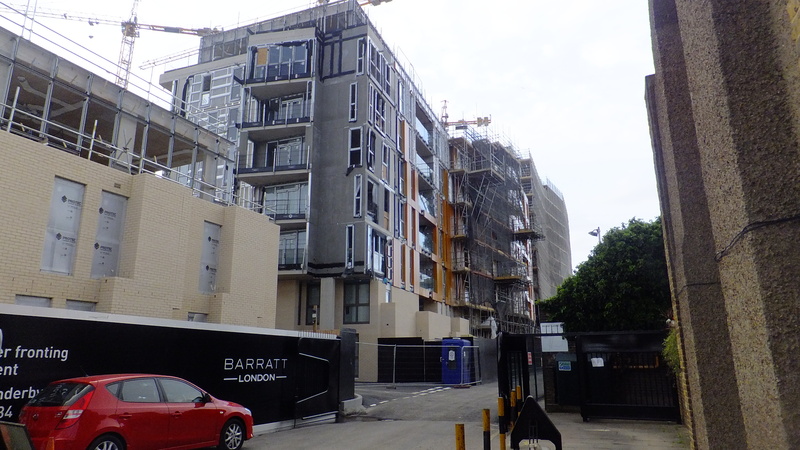 Heading from here over to the south-west of the Peninsula and River Gardens (Lovell’s Wharf) is progressing quickly. Previous stages were some of the worst recent builds on the Peninsula so hopes are low with this one. There’s little to see so far. 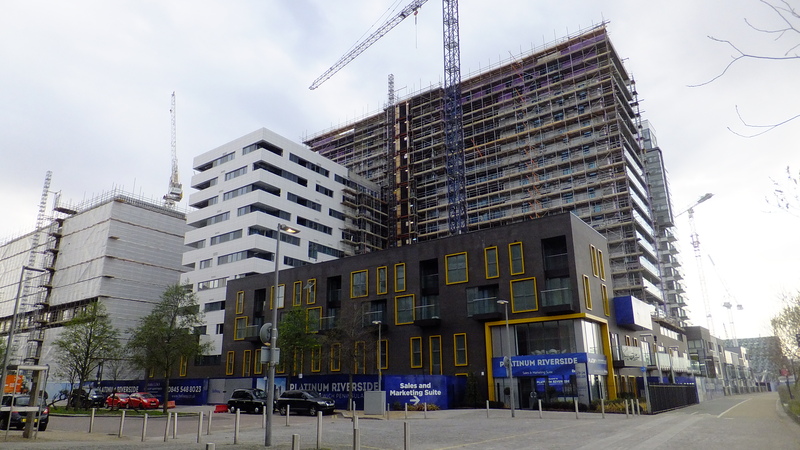 Close to this is Barratts development at Enderby Wharf, which for me at least has had less promotion than the others. One block seems close to completion. 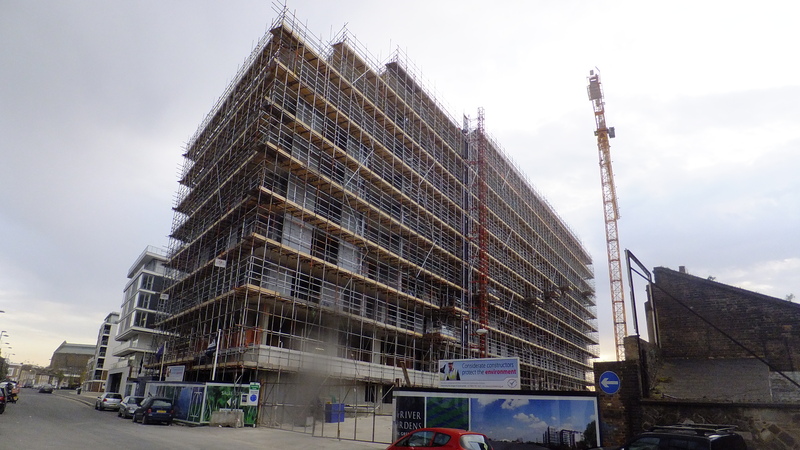 This should look pretty distinguished with orange cladding which has started to be applied: This development will eventually have 770 homes with just 154 ‘affordable’. EGRA’s site shows the planned timeline for developing the whole site. 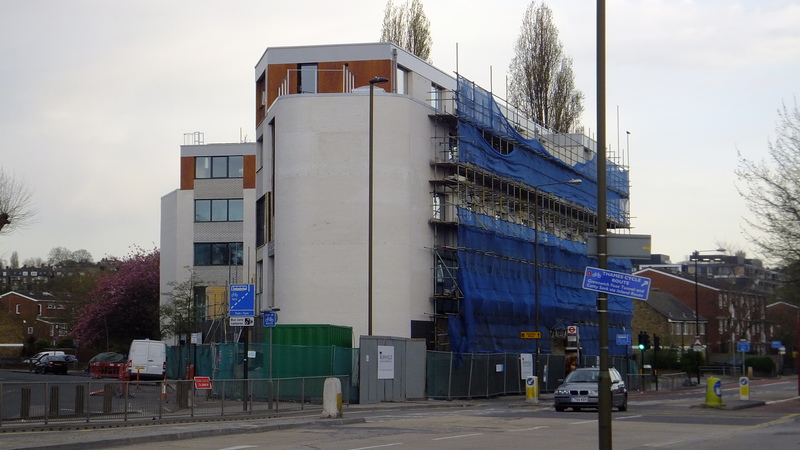 Also nearby is a smaller development from Mulberry on a triangular piece of land between Tunnel Avenue and Blackwall Lane, opposite the Meantime brewery. The brickwork on the corner looked in a poor state even before completed. Hopefully that’s rectified. There are also plans for a large Church of England backed school on the Peninsula. A new consultation on the school is happening today (17th April from 4-8pm) and tomorrow from 10am-1pm. The plans have raised much controversy. There’s a petition about it here. Plus, nearby in Deptford there’s a consultation over the next few days on demolishing industrial units and constructing 320 homes at the Arklow Trading Estate. The site is located where two lines into London Bridge merge. Tomorrow they will be at the Deptford Lounge from 10am to 2pm. Back to Greenwich and many of the new developments at the south of the Peninsula are actually located closer to Southeastern stations than north Greenwich tube station, yet the walking and cycling routes to stations under the Blackwall Approach are pretty awful. Both trains and tube are suffering capacity problems, so spreading the load would make sense. A new post on London Reconnections highlights how tube upgrades are falling behind schedule, with an upgrade in Jubilee line frequencies possibly falling three years behind the original plan. Encouraging new passengers across different modes thus seems necessary, particularly if Southeastern ever gets 12-car trains and congestion is reduced after 2018. In a follow up post I’ll look at the pedestrian paths from these new developments to stations like Westcombe Park, and also the shops at East Greenwich. They would greatly benefit from the many newcomers, but the walk to reach them, as it stands, is far from enticing. EDIT: I’ve created a flickr photography account and many more photos of the area can be seen by clicking here. 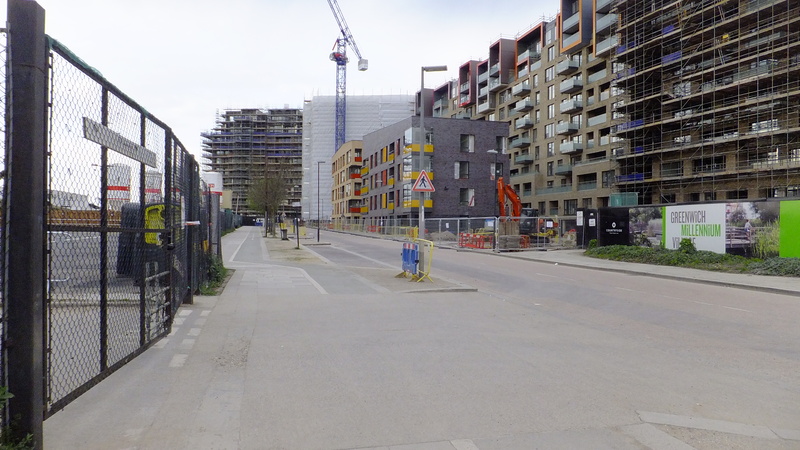 I was hoping TfL would use this land in Deptford to connect the Overground to the Deptford to Charlton stretch of mainline track, or at least terminate at Deptford station, in the same way that the Overground already terminates at New Cross. Thus additional services can be added to this Deptford to Charlton route and an additional 4 services can be added to Surrey Quays – Highbury and Islington. This could act as a measure of relief on this line that was highlighted in your previous article. It would be great to have a link with LO. New Cross to Deptford couldn’t displace any SE trains though as they’re packed and mostly 8-10 carriages, whilst LO is 5 maximum. Just a point of clarification. The proposed C of E aided school is not a free school. It is an LA maintained school, a major expansion ( on a second site ) of the primary of the same name in Woolwich. Thanks for that – I will amend it.